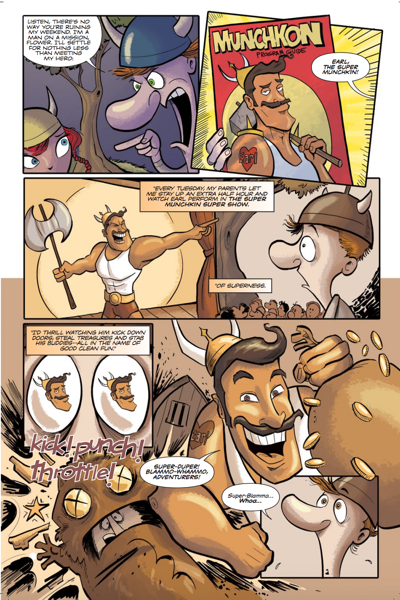 We've got a sneak preview of the upcoming Munchkin comic issue #15 from BOOM! 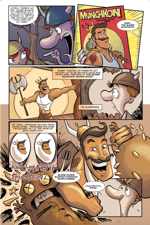 Studios, written and illustrated by our own Munchkin Guest Artist Len Peralta! Spyke and Flower are journeying through a dystopian wasteland . . . I mean a convention, to meet Spyke's hero: Earl, the Super Munchkin. All he has to do is navigate the labyrinth of cosplayers, nerds, and swag they find at MunchKon. Easier said than done! Len also did a Speed Drawing of the cover! You can check it out on his YouTube channel. 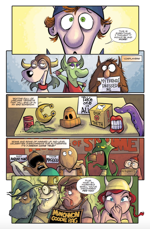 Munchkin #15 is available later this month at Friendly Local Comic Stores everywhere. And don't forget the promo code in the back!